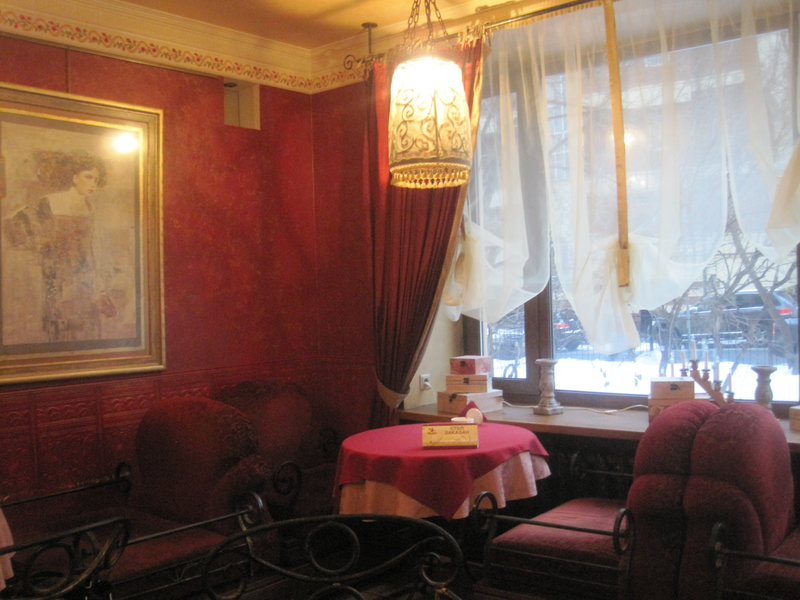 For yesterday lunch I met my mom to visit Gogol-Mogol a Moscow cafe she found recently. Male part of the family skipped as they do not go to "you girly cafes". It's located near Cathedral of Christ the Saviour on Gagarinsky pereulok 6. It's been a long time since I had such a nice finding. The entrance is hard to notice from the street, I'd easily miss it if I wasn't looking for the cafe on purpose. "Excuse me, why are you taking pictures?" - I got asked by a waitress standing outside and talking on her mobile. This was the first thing I saw entering. Looked like a good beginning. I passed into the dining hall. At 3 pm it was still quite busy with people having lunch and chatting. Let's have a look at the menu. It's small, English translated. For a hungry person it's a real challenge to make a choice though. 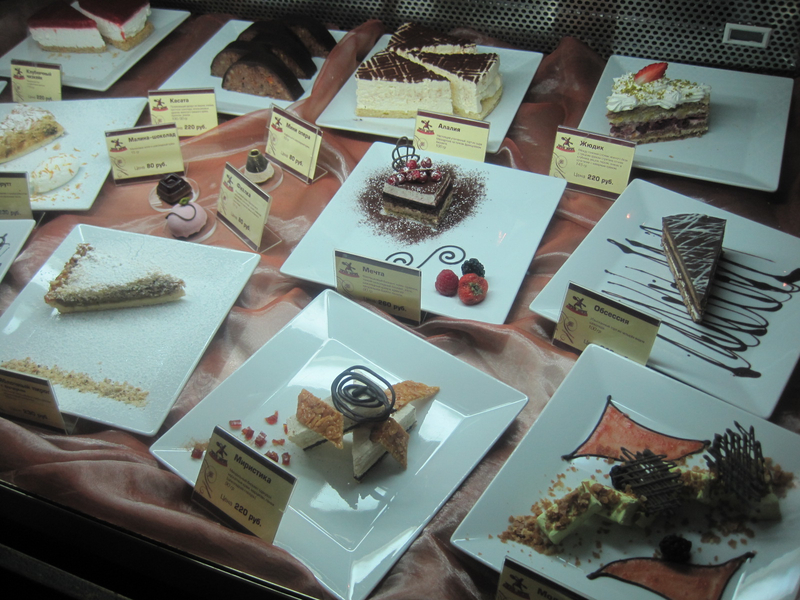 They have cafe style food (salads, soups, pasta, lasagnas etc) which looked really beautiful. 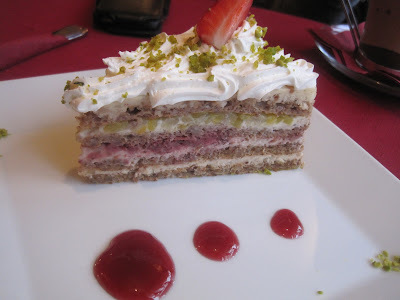 I saw those served at neighboring tables, and not to girls only. Biggest deal however are of course the sweets. After looking through all those pancakes, cakes and mousses served with beautiful ice-creams and fruit sauces I almost gave up my hope to decide on something. 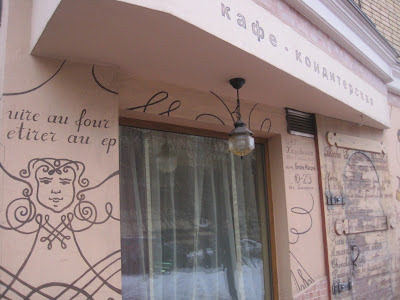 Finally we got the Kogel-Mogel, which was an easy choice (that's what Russian "gogol-mogol" stands for). 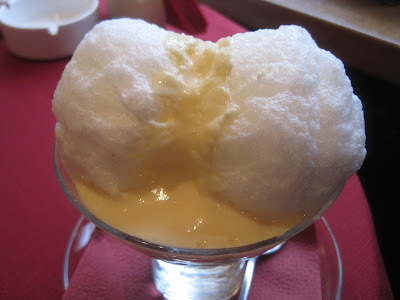 With huge meringue on top it resembled the French Floating island. 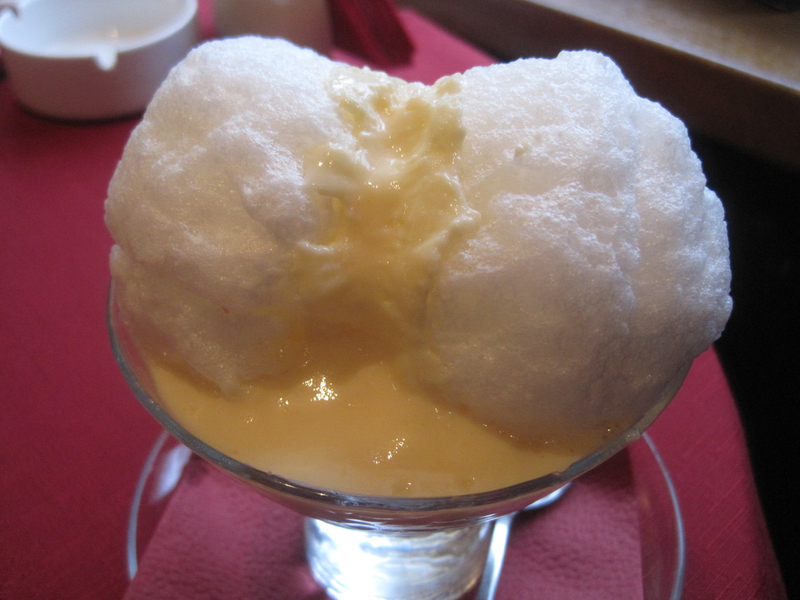 The egg yolk sweet cream itself was very good, but much thicker than Kogel-Mogel I'm used to. When cooked at home in my childhood it was always quite liquid, more like a sweet creamy drink. 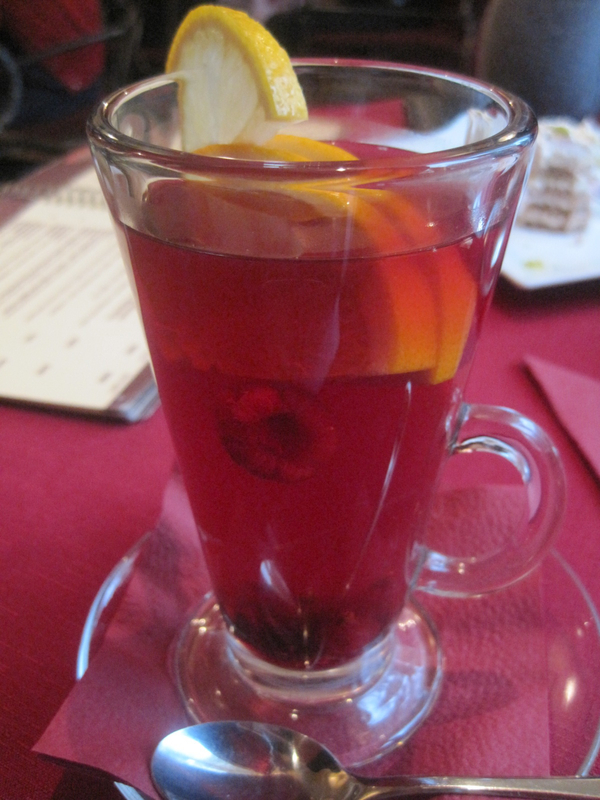 The spicy orange and raspberry tea was flavorful and warming. At 4 pm most of the clients disappeared. The hall became quiet and peaceful. Now I noticed the atmosphere creating music - something old style, a bit similar to Amelie soundtracks, but sang in Spanish or Portuguese. I'd love to get the music, but the waiters pretended they didn't know what was playing. 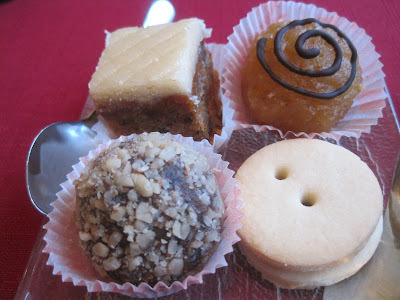 We got Moroccan coffee with chocolate and more sweets: Judique cake and Petit four set. I liked the soft cake with cherries and cream-moist pistachios. The miniature carrot cake and orange-rich "Illusion" petit fours are quite catching as well. So we're coming back soon to listen to some more Spanish music and try some more sweets. Oh, are you going to leave? when? are you moving somewhere else?